Bolette Roed is a Danish-born recorder player continuously striving to extend the instrument’s repertoire beyond its established role in Early Music, towards new frontiers of improvisation, folk, and world music. This inquisitive perspective has led her to perform in various unique ensembles, notably the Alpha constellation, a double prize winner at Denmark’s Radio’s chamber music competition in 2006 and finalist both in the prestigious New York Concert Artist Guild Competition 2008 and the 2010 TEREM Crossover Competition in St Petersburg. Bolette Roed showcases her range as a soloist as she was awarded DR’s “Artist of the year 2005” and is fluent in the world of Medieval, Renaissance, Baroque and Contemporary Music. She further aspires to adapt canonical classical works to the recorder, and stays in constant dialogue with and commissions new works from today’s composers. 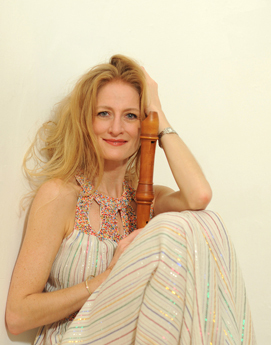 Since 2004, Bolette Roed has toured extensively as a soloist with the baroque orchestra Arte dei Suonatori and has performed as a soloist with Concerto Copenhagen, the Danish National Chamber Orchestra, the Danish National Symphony Orchestra and the world’s oldest orchestra, the Royal Danish Orchestra. Furthermore, she enjoys performing with her ensembles Elephant House Quartet, Concert Pastoral, Alpha, and Sarbak/Roed duo, and she regularly records with orchestra Arte dei Suonatori, with her own ensembles as well as featured appearances. Bolette Roed is also a devoted and passionate recorder teacher at the Royal Danish Academy of Music in Copenhagen and orchestrates various master classes across Europe. She is also the co-founder of Denmark’s baroque music festival “Midsommerbarok” during the Copenhagen summer. Bolette Roed is finally, also a medical doctor from the University of Copenhagen.